Alfred Hitchcock made many great films, but he also made many that critics and audiences largely dismissed. These least celebrated films, despite their admitted flaws and relative obscurity, offer much to reward the open-minded viewer. 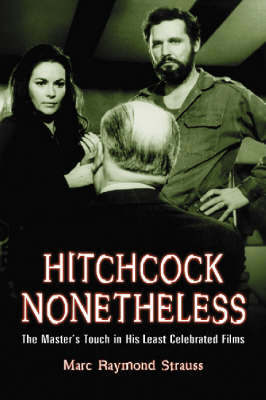 This critical study examines and reappraises fifteen such films generally overlooked by scholars and Hitchcock aficionados: Juno and the Paycock, The Skin Game, Waltzes from Vienna, Jamaica Inn, The Paradine Case, Under Capricorn, I Confess, Torn Curtain, Number Seventeen, Rich and Strange, Secret Agent, Mr. and Mrs. Smith, Stage Fright, The Wrong Man, and Topaz. Each film is discussed and analyzed in detail, revealing the master's touch in many previously unheralded ways. Brief assessments of the films from popular review compendia introduce each one, and excerpted highlights of numerous works of scholarship are liberally sprinkled throughout the text. In addition, wonderful rare still photographs from each film are included. Readers will come away with a richer sense of the director's talents in these films, adding to their appreciation of his work in unexpected ways.